Little Vegas Wedding Blogiversary Giveaway #2: Custom Vegas Wedding Cake Topper! Here’s the second big blogiversary giveaway! Again – thank you so much for your support, submissions and readership over the past year. I’ve loved learning about all the crazy awesomeness that Vegas weddings have in store and can’t wait to see what the next year has in store! Today’s giveaway is a custom handmade wire caketopper with a Las Vegas theme made by Heather Boyd Wire! Heather and her husband handmake these modern, light and memorable wire cake toppers out of their studio in Montreal, Canada. I fell in love with their work when I saw it in a wedding Mike Lichtenwalner photographed earlier this year at Cosmopolitan’s Pop Up Chapel. Heather is incredibly talented and makes all sorts of wire cake toppers, including cute ones of a couple on a bicycle, hot air balloon and more – check out all the great designs she does here. The designs are made out of a single piece of wire when possible, and customized with your names and wedding date. The giveaway is a mini version of the Welcome to Fabulous Las Vegas Sign. The wire is non tarnishing and long lasting – they are more miniature sculptures than cake topper! I made my own cake topper out of Fimo clay, and it totally broke enroute to Vegas. If only I had known about Heather’s wire creations then! 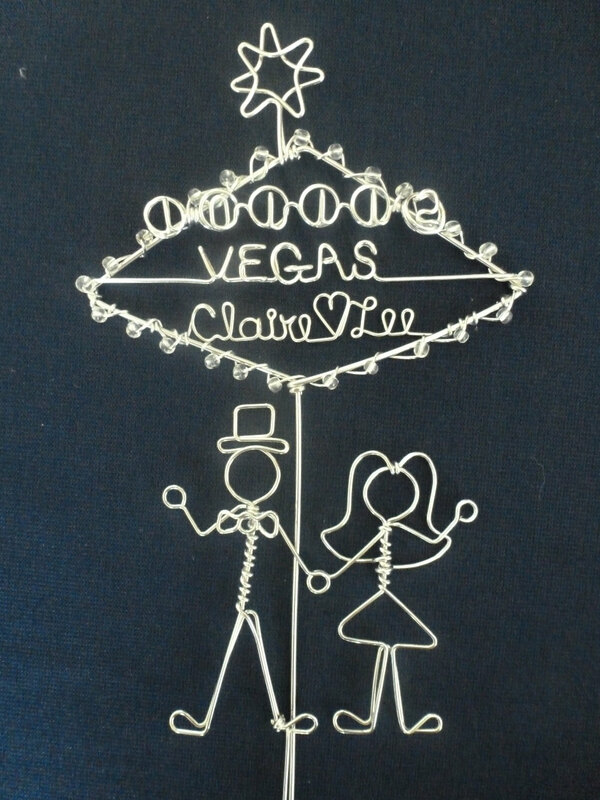 Prize: One lucky reader will win a custom wire Las Vegas wedding cake topper handmade by Heather Boyd Wire! Valued at approximately $70 CDN. To Enter: You can enter this contest up to three times. You get one entry each for liking Little Vegas Wedding and Heather Boyd Wire Art on Facebook, or tweeting about the giveaway. Please use the widget above to enter. To Win: One winner will be selected at random via Rafflecopter and announced on the blog on June 10, 2013. « Little Vegas Wedding Blogiversary Giveaway #1: Pomp & Plumage Adornments! 1 Comment on Little Vegas Wedding Blogiversary Giveaway #2: Custom Vegas Wedding Cake Topper! OMG these are the cutest! Even if I don’t win the giveaway, I might buy ’em anyway!